One of the things that relieves our stresses from the daily work-life grind is to have a perfectly paced massage day. What would make the pampering experience better and uber relaxing than to having it done at one of the best wellness centers in the city - The SPA. I'm happy I was finally able to use the The SPA gift certificates I received last Mother's Day. I know, I know.. what took me that long to use it right? June and July came as two of the saddest and busiest this year. I wrote about that HERE. Glad that GCs nowadays don't come with an expiry date. 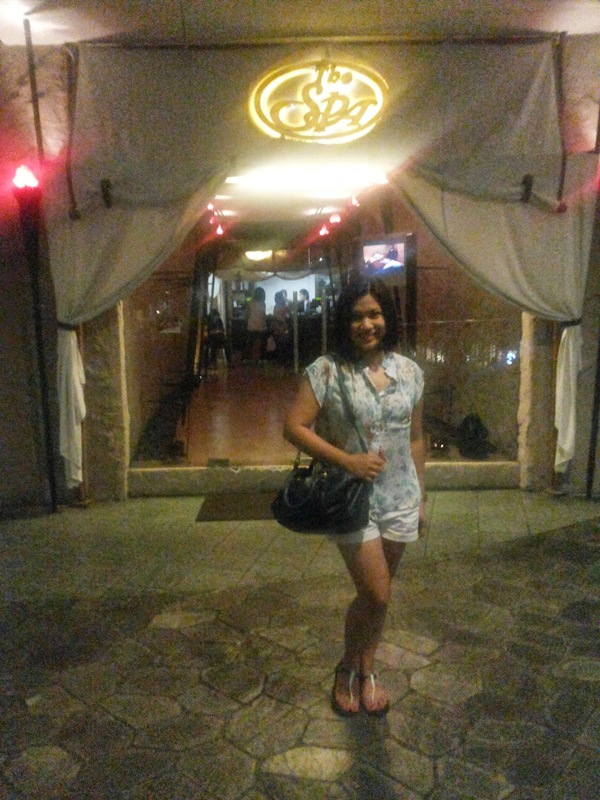 Happily, hubby and I had a chance to unwind and visit The SPA in Trinoma a few weeks ago. Having a massage together is what we love to do as a bonding activity. He actually learned how to appreciate spas and regular massages from me. I would highly recommend that you should have a massage regularly to ease the tension that your body have and it's also good for blood circulation. Upon entrance to the shower and steam bath area, I was assigned a locker so I could keep my personal belongings and also hang my clothes. Yes darling, you'll be required to change or take off your clothes and just wear a robe or cover yourself with a towel. 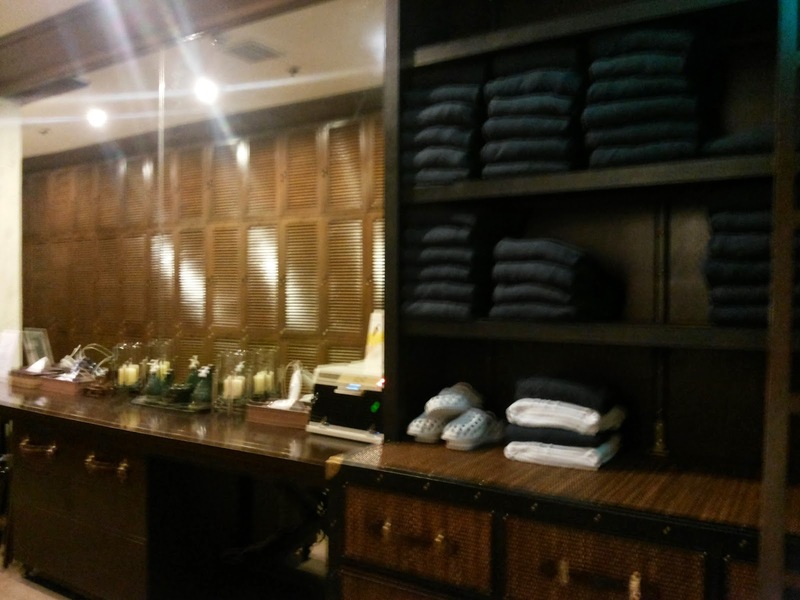 The Spa always has a stack of clean towels, robes and slippers for their clients. 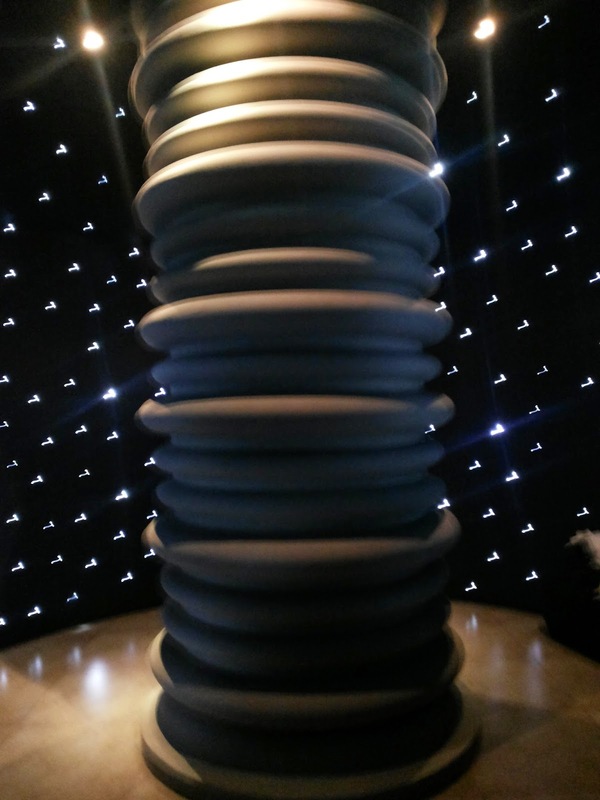 Before stating with the Executive Swedish Massage for me and Shiatsu Massage for him, we separately took a shower and had our 30-minute steam baths. I always make sure I take advantage of the steam bath, saunas or a Jacuzzi in spas I would go to. Why? Because they are good for relaxing and warming the tensed muscles and detoxifying of the skin through quick and excessive sweating. Shower cubes and steam bath room. By the way, it's important that you don't eat heavily nor drink alcoholic beverages before your massage. 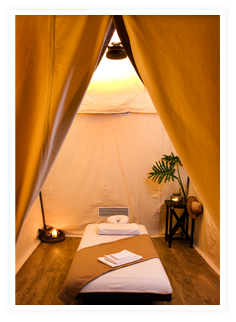 You might feel nauseated or light-headed after the massage if you did. After our separate shower and steam baths, The SPA gave us a cup of their signature ginger tea before heading on to our massage room. We usually take couple's room when we have our massages together. 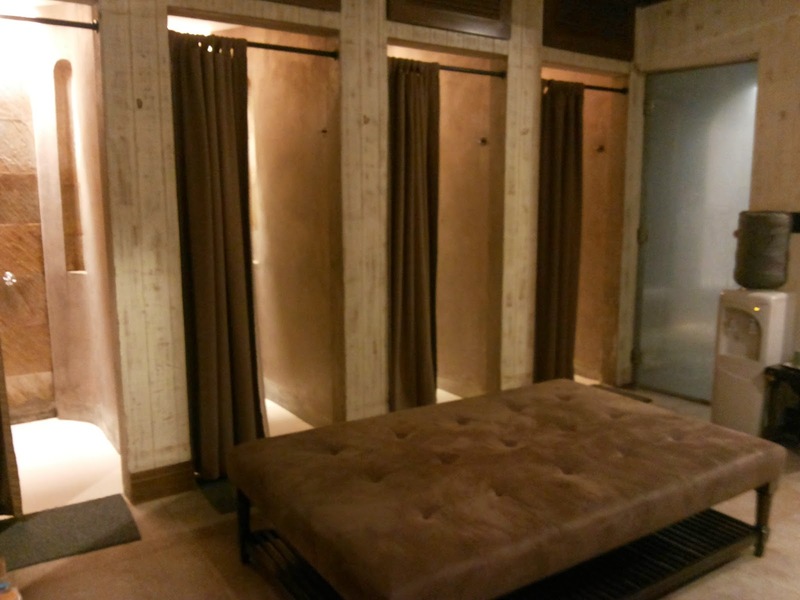 You will be asked to undress by the therapist, but no worries if you're shy or uncomfortable, you'd still be pretty much covered with a blanket the whole time. When having a massage, communicate to your therapist your preferred pressure. If you like it just light, medium or hard. You may also request her to concentrate more on one area of the body if you wish. I always request a longer massage on my feet and upper back. Also tell if there are areas you don't want them to touch or put too much pressure on. 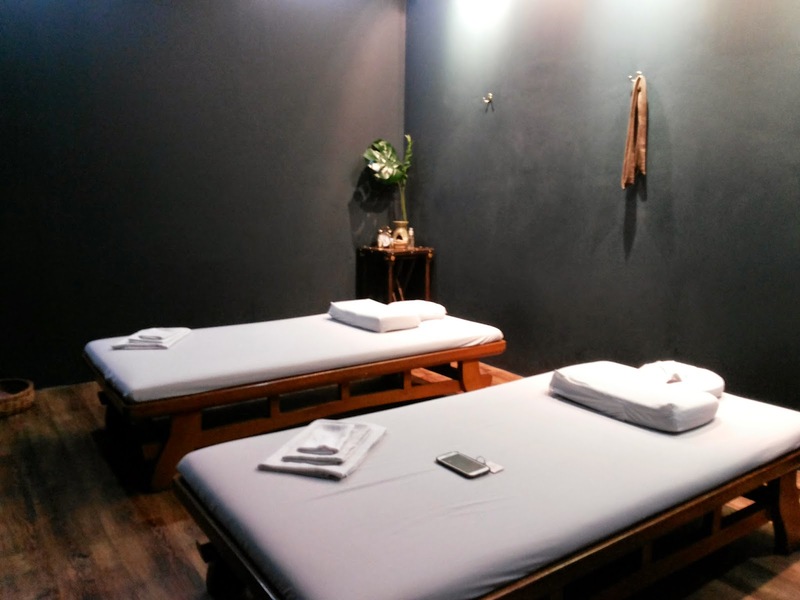 Covered massage rooms: Common, Executive or Couples room are available. Interesting ante-room from the shower going to the massage area. Locker and grooming area. 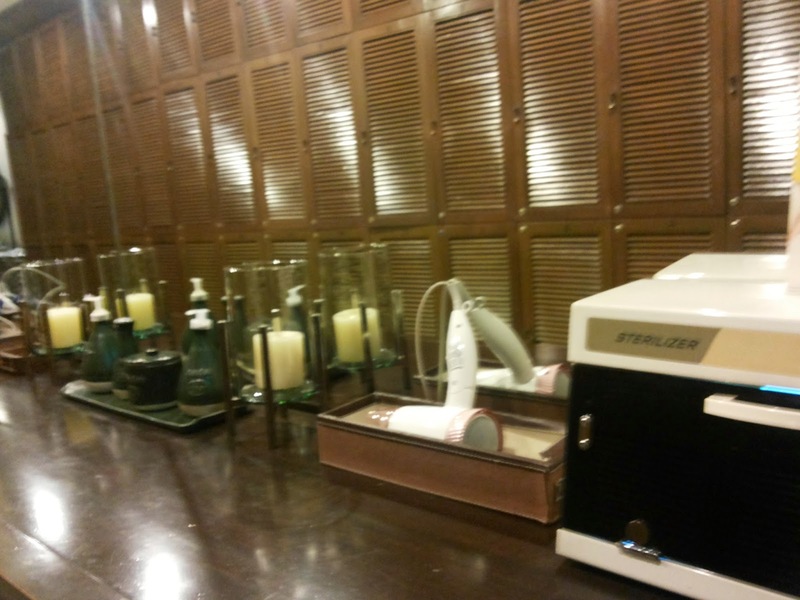 Lotion, powder and hair dryer are available for use. The massage was so good that I dozed off. Good thing the therapist politely woke us up to notify us that our massages were done and to get ready for our next set of services. After the massage I had manicure and pedicure done while hubby had The SPA's Feetish Foot Spa. 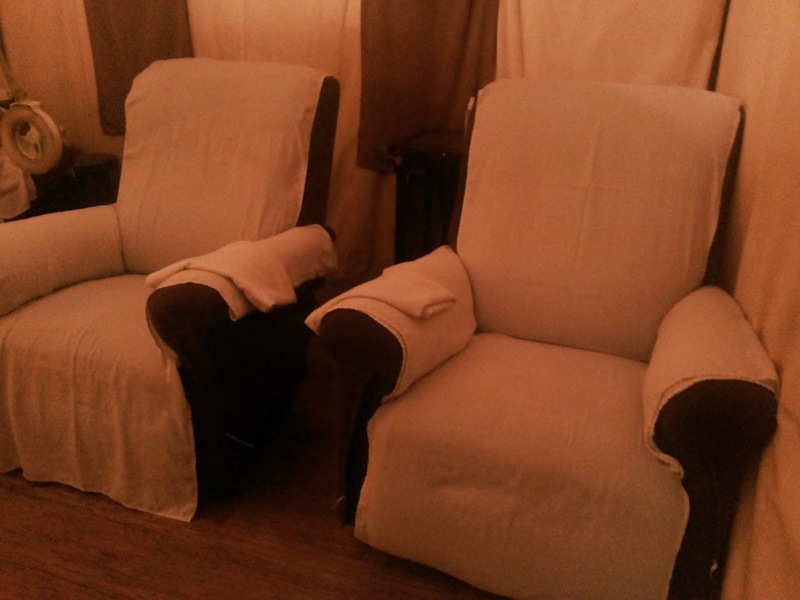 We were escorted to another room which had lazy boy chairs to ensure that the pampering experience would be nothing less than relaxing. The Feetish Foot Spa lasted an hour. Scrubbing, masking, massaging and some more scrubbing were parts of the foot spa. Hubby rarely gets foot spa, so this one he enjoyed so much. Getting his Feetish Foot Spa done. 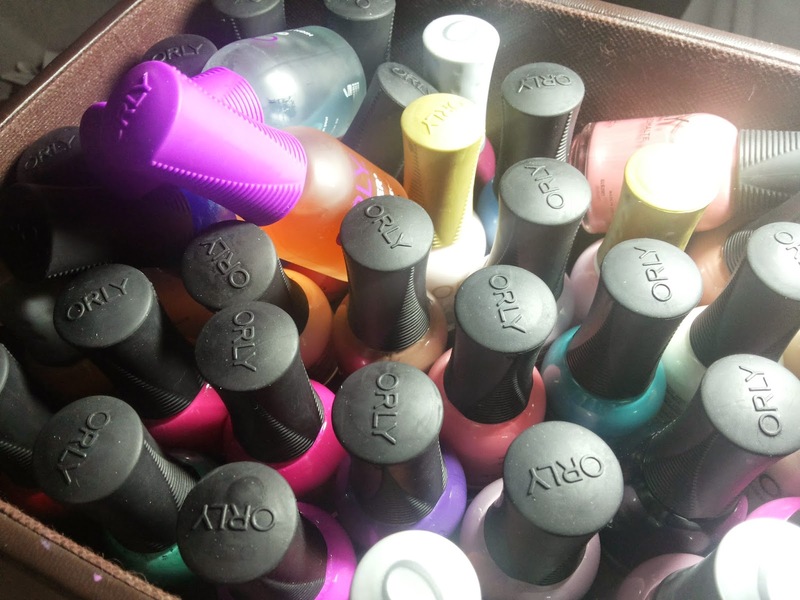 I on the other had, chose from the pretty colors of ORLY nail polishes for my nails. I chose two different colors, bloody red for my toes and a light one for my nails. The SPA uses ORLY Nail Lacquer. Here were the pretty colors I had to choose from. Chose a light one for my nails. For my feet, I chose a red nail lacquer. One of my favorite nail colors. 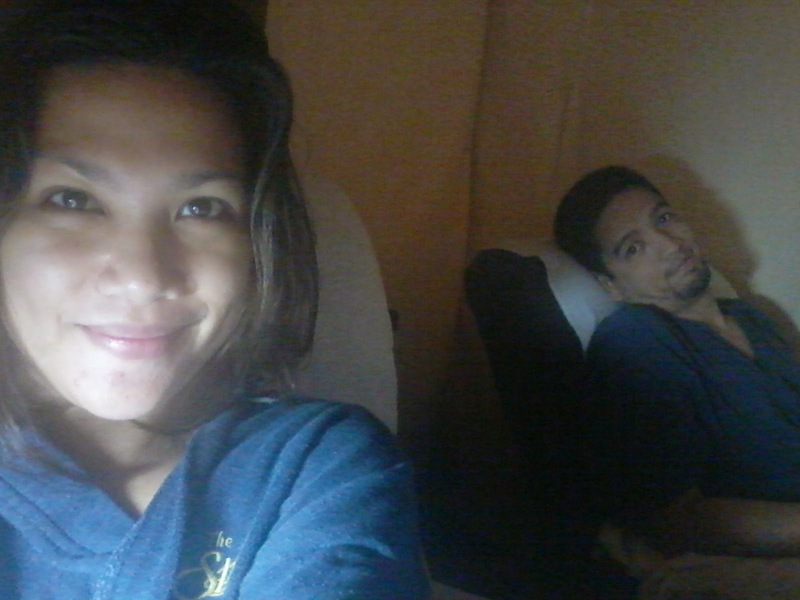 You sure could tell from the look on our faces that we enjoyed our bonding and pampering time at The SPA. I'm grateful for the GCs I received that we were able to experience this. 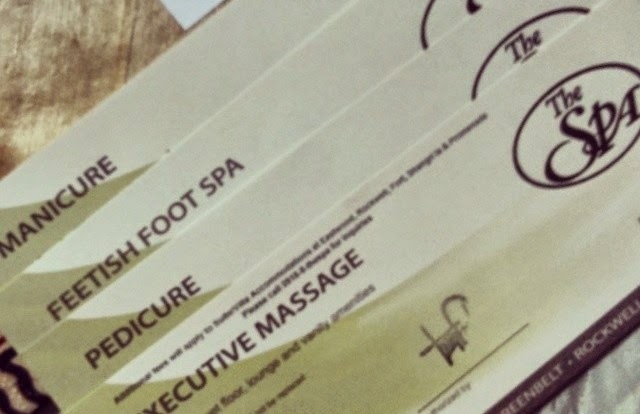 If you have a bigger budget for a massage indulgence, I would recommend that you have it done at The SPA. The SPA has four different types of service accommodations: De Luxe and Executive are the more affordable ones while the Premiere Suite/Villas and the Loft for me are for those who want to experience luxurious spa privacy. The Loft however is recommended for sparties and events but only available at their The Fort branch. Do make an appointment first by calling the branch. Tell what time you are coming and when you want the massage done. Do tell if can't make it to your appointment. Don't eat heavily nor drink alcoholic beverages before the massage. Do be comfortable and trust your therapist. Do be clean before the massage starts. Do communicate your preferences to your therapists. Don't be noisy or talk loudly so you won't disturb other guests who came there to relax. Don't forget to give service tips. Do drink plenty of water after the massage. Don't work out after the massage, let your muscles repair and relax for a bit. As a busy mom, whether like me you work full-time or stay-at-home/work-from-home, a good massage is highly recommended for you to ease the tensed muscles brought about by all the hard work we do at work and at home. Don't be guilty for sneaking at least an hour for this healthy me-time. 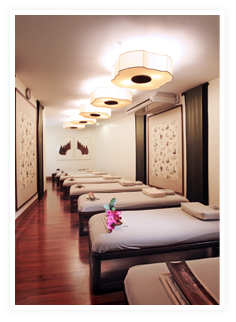 Indulge in a therapeutic and relaxing massage at least once a month for an overall body repairing and rejuvenating. 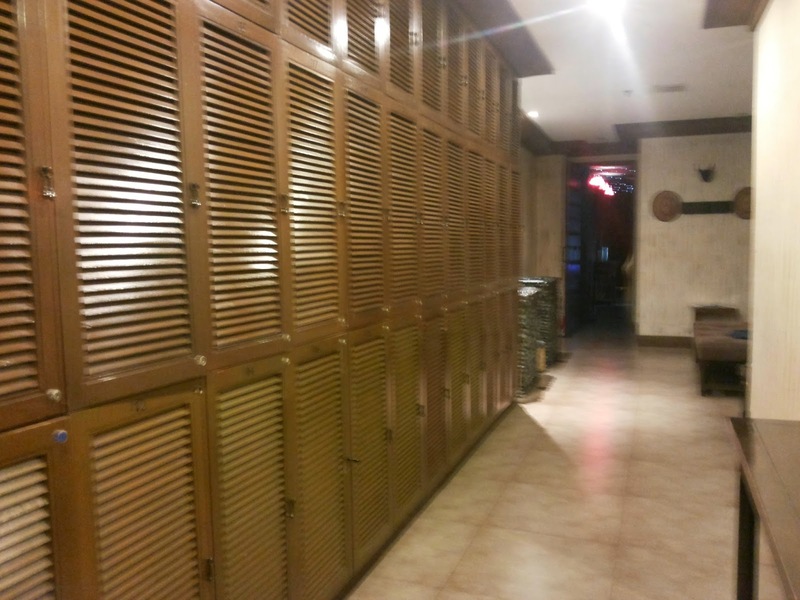 For more information about The SPA (menu of services, branches and complete contact details), you may visit their website: http://www.thespa.com.ph/. You may also like them on Facebook or follow them on Twitter. package 1 is P3.8K x 2 for 60 pax plus party fee mga around 10K. Thanks. Bakit po samin d inallow ang items galing labas,like hats,name tag etc kz wala silang stock?sabi nila ung branch nila marereport bat sainyo allowed pati cupcakes? There were no party hats name tags which were brought in from outside. Cakes are optional if you buy from them or not. So bringing in from outside is OK as long as we don't EAT them inside. Thanks. Hi Louise, may I know your food choices? saken kasi 90pax costs almost 15k na, feeling ko tuloy overpriced. Thanks. Bakit po yung sa amin 25k+ po pero wala pong naibigay na freebie? hindi po kaya nakalimutan lang iabot kasi ung nga rin po yung usapan last time tapos nag end po yung party pag dating namin sa bahay is dun lang namin naalala na wala silang ibinigay. All branches offer the same party packages, depending on the food and number of pax who will attend, also party favors. Kindly check on the branch of your choice for more details. Thanks. Pano po ung sa party now pay later ? Anu po ba meaning nung party now pay later nyo ? Hi much the cost if i order 50pax of value kids meal...party in school? Hello Joyce! 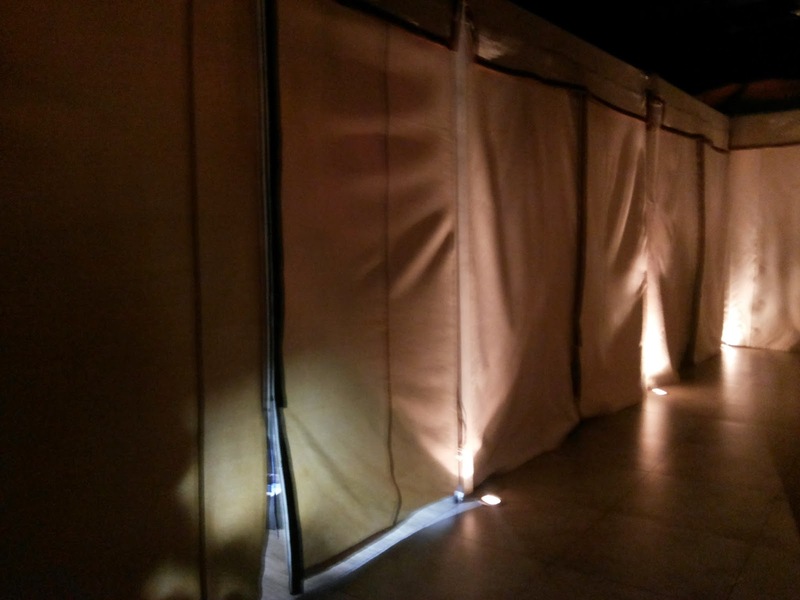 I just wrote about my experience of my son's birthday party in a Jollibee branch, which you may get ideas from this post. For other set ups and costings, you may directly ask the Jollibee branch near you because I think they will include a delivery charge. :) Thanks. I have actually read a lot of your blog posts in the last hour. I really enjoy what you are doing here. (And as a writer of fantasy novels, I'm enjoying looking at different aspects of that when you go through them in blog post). And truly, I love world-culture building.very comfortable chair i feel very relaxed when i massage on this massage chair.